What Wine Region Would You Like To See Featured? Get Your Wine Pass Today! Each month we will feature a different wine region and highlight some of the hidden gems to help you learn more about what makes each wine region so unique! You will get to know the wineries and the regions up close and go behind the scenes to meet the people who make it special! Each month, you will get EXCLUSIVE World of Wine Guide Member deals from wineries around the world. Discounts on your order, free or reduced shipping, and other special deals ONLY for World of Wine Guide Members. 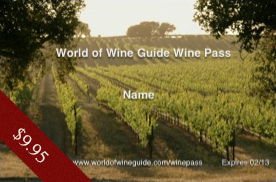 For just $9.95 per year, our World of Wine Guide Pass will get you even more EXCLUSIVE deals when visiting wineries! Free tastings, 2 for 1 tastings or discounts on your purchase! Each month we will continue to add participating wineries to our list!